Some things just never change. From our origins as a dyeworks company back in 1911, when we helped Winnipeggers rejuvenate their old clothes, to the full service uniforms and facility services company we are today, Quintex has always been about helping people look their best. Today, more than 2,500 Manitoba business and organizations trust their image to Quintex, a responsibility we take very seriously. 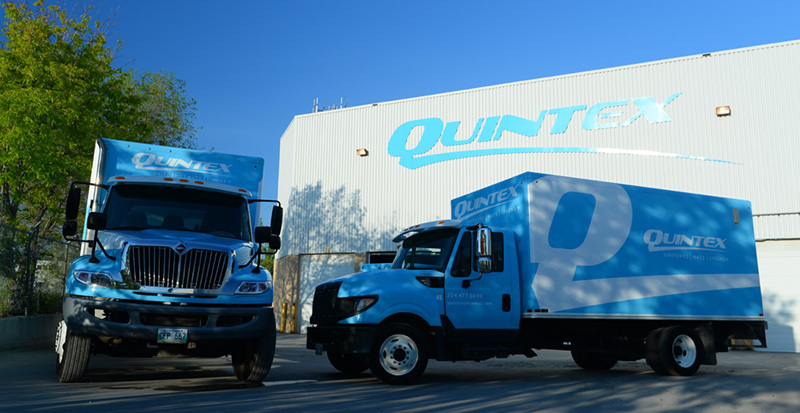 Quintex is located at our 55,000 square-foot service facility at Nassau Street and Pembina Highway in Winnipeg. Our number one goal, beyond delivering an exceptional service at a fair price, is to make the lives of our clients easier. We do this by helping make sure their employees are always smartly dressed, their floors neat and tidy and their buildings well stocked with those easy to forget essentials that you only miss, well, when they are missing. You might say we are behind the scenes silent partners for our clients. Because when they look their best, we look our best. Catch a glimpse of what we do here at Quintex. Want to see more on how we operate? Book your tour of our facilities today! To know more on how we became the company we are today read about Quintex's history.